The village of Bray is the smallest place in Britain with the most millionaires – 160 of its 4,600 residents have assets of more than £10million. A cluster of 7 Michelin stars will do that to place. But you don’t need to be ordering a super yacht to visit (phew). 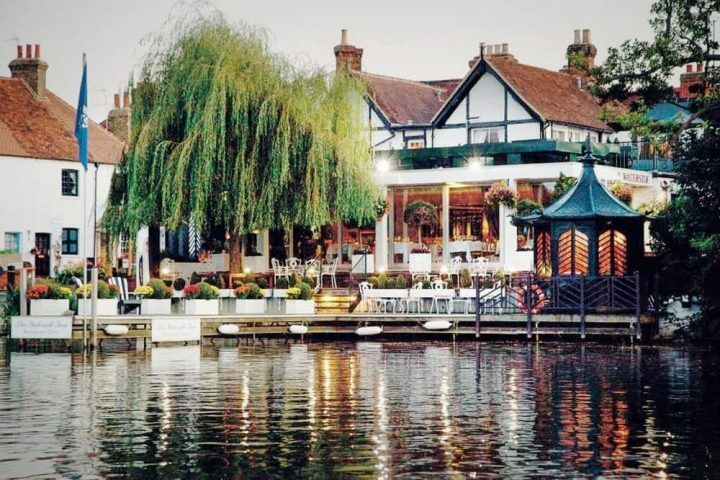 Nestled on the banks of the Thames, it’s picture postcard pretty, just 30 minutes from London and boasts two of the UK’s three-star Michelin restaurants – Alain-Roux’s The Waterside Inn and The Fat Duck, Heston Blumenthal’s flagship – plus Heston’s one Michelin star posh pub The Hind’s Head. Nothing stuffy, but lots of luxury. Like dining with in your besties country house (if they happen to be one of Bray super-rich). 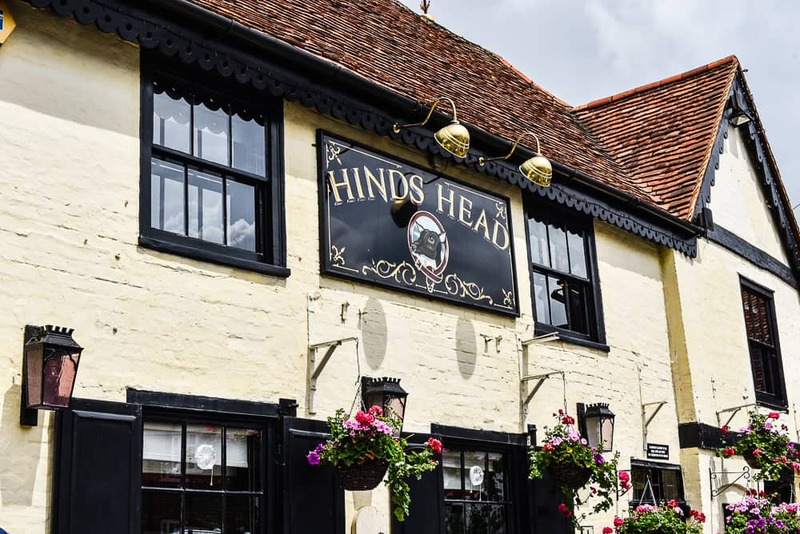 A 15th century inn, the Hind’s Head offers what it calls ‘traditional British cuisine’ with a menu that reintroduces some historic dishes with a hit of Heston theatre. But to be honest, the ‘pub’ is more like a batty uncle’s country house, serving awesome cocktails every bit as surprising as the food. 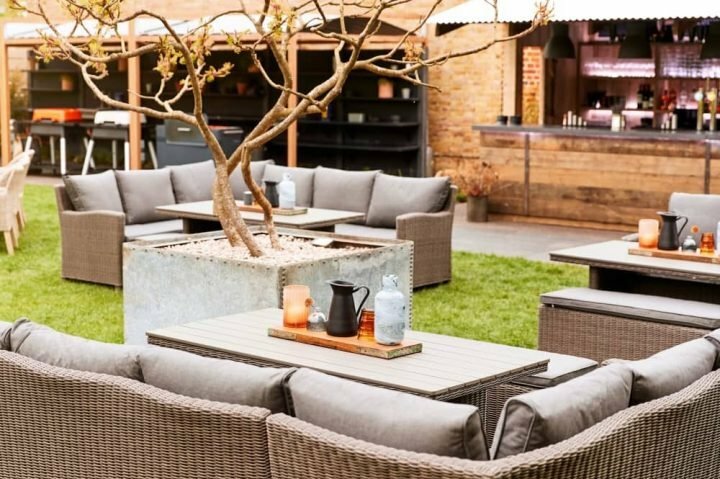 The Tudor building (famously owned by the unprincipled Vicar of Bray) was given a spectacular makeover a couple of years ago and Head Chef Pete Grey (a Heston veteran having worked here for more than 4 years), has made the kitchen is own. 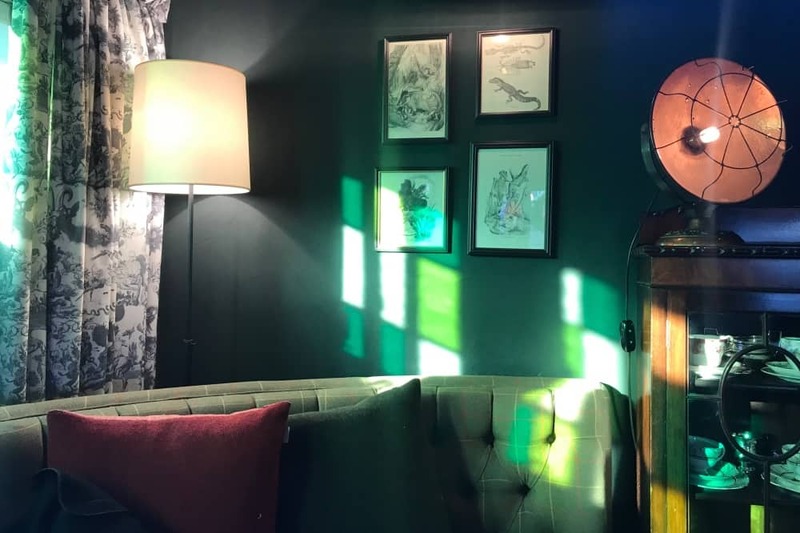 One of my fave bars in Berks – The Royal Lounge where hunting lodge vibes meets gentleman’s club chic. 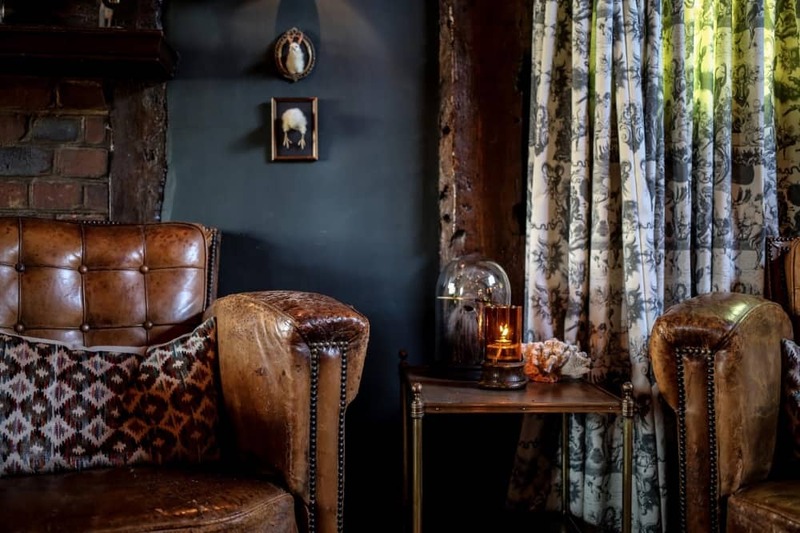 The look now reflects its hunting lodge and coaching inn past, with a vibe that is elegantly eccentric with a nod to the many royal connections. Upstairs is now The Royal Lounge (venue for Prince Philip’s stag do)– essentially it’s a cocktail bar, with tweed and velvet furnishings, taxidermy and dim lighting. Think cool gentlemen’s club without the overflowing testosterone and a hint of granny chic. Think silver tea service and vintage china. A right royal knees up is demanded in The Vicar’s Room – private dining with added drama. 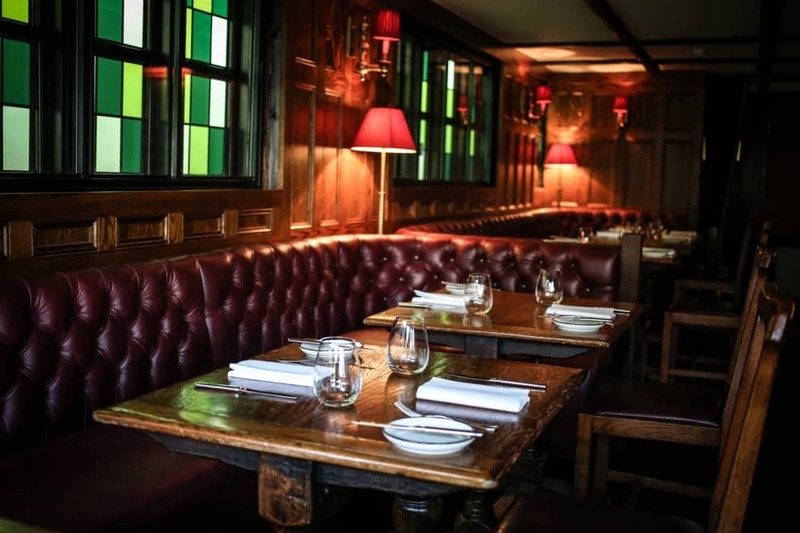 The restaurant is now solely on the ground floor, a rich mix of wooden paneling, leather chairs, settels, fireplaces and parquet flooring. It’s relaxed, buzzy and the service is attentive, as you would expect from a starred gaff, but the surroundings are informal yet luxurious. 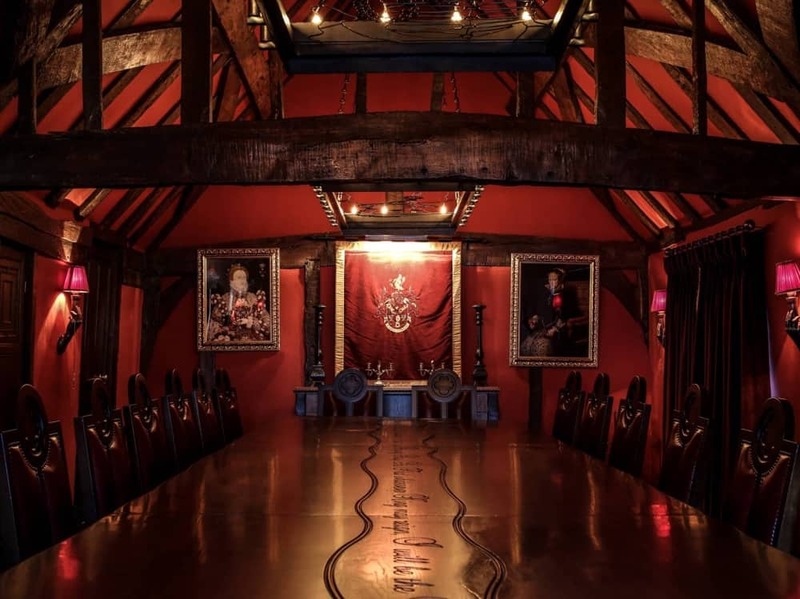 For private parties you should book the dramatic Vicar’s Room (there’s no hire charge), where you can dine surrounded by Queen Elizabeth I and Queen Mary. Do not miss the opportunity to sink a cocktail in The Royal Lounge – it’s theatrical and very cool. Aesthetically it is right up my street – shotgun chandeliers, Heston and his team immortalised in curtain fabric and cool artwork. The drinks menu is vast, craft beers, artisan gins and spirits, cocktails and mocktails that taste as good as the ones with booze. 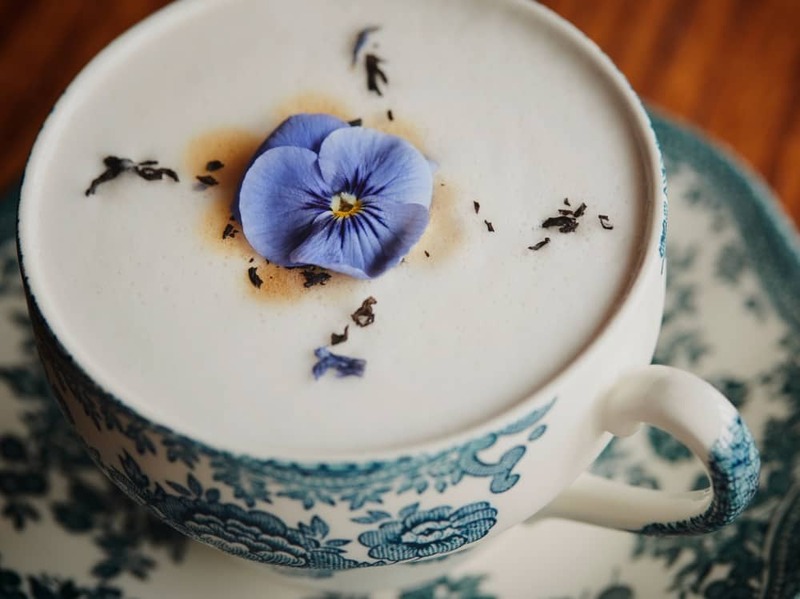 I’ve worked my way through the menu on more than one occasion (it was a sacrifice but for you, anything), but I always go back to Emily’s Earl Grey Tea Sour, served in an elegant tea cup, not too sweet, totally drinkable made with gin, elderflower, tea bitters, Earl Grey syrup and Pimms float. Yum. There’s always a danger these things can feel gimmicky, but the execution is creative and just what the Hind’s Head is all about. In the restaurant we sat next to enormous fireplace on the ground floor. Snacks are available in the Royal Lounge, an la carte menu is served in the restaurant, with the addition of a 3-course set menu at lunchtimes. For food of this quality it’s a bargain at £25 pp. To kick off lunch, I couldn’t resist the signature Scotch Egg. 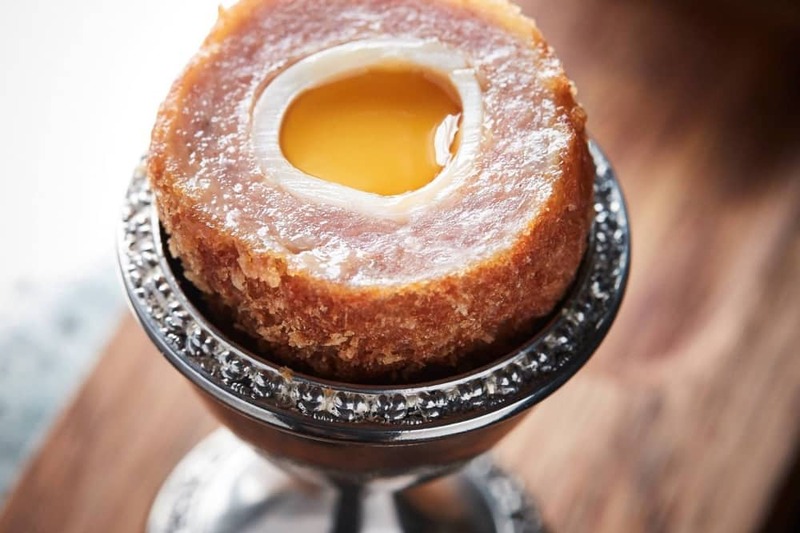 Served in a silver egg cup with a mustard mayo, it’s perfection. You can have these as a snack in the Royal Lounge too, if you want tickle your tastebuds while popping for drinkies. 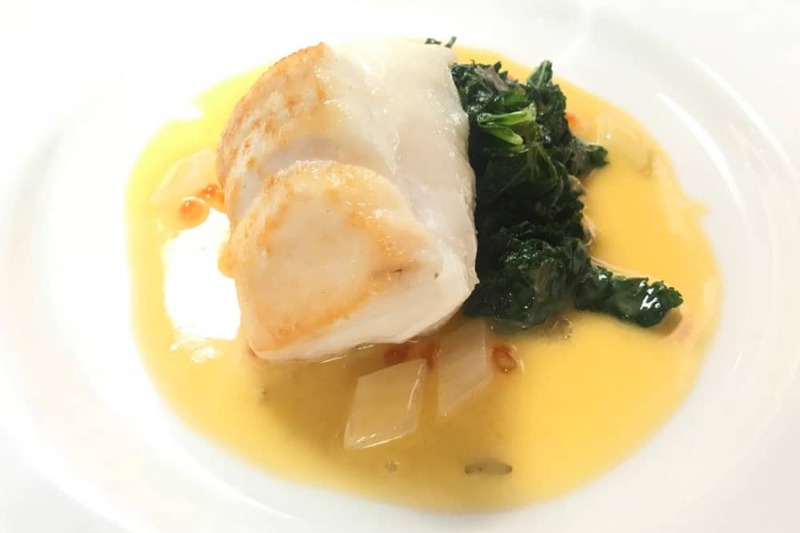 Next up, roast cod one a bed of kale surrounded by a fennel confit and cider butter sauce. It was light, indulgent and perfectly balanced. In the wrong hands the sauce could’ve been a greasy mess, but this was glossy and flavoursome to accompany a beautiful piece of fish. Melt in the mouth lovely. For pud, Cherry Bakewell tart and yoghurt ice cream. Oh my days, who needs Mr Kipling when you have this! 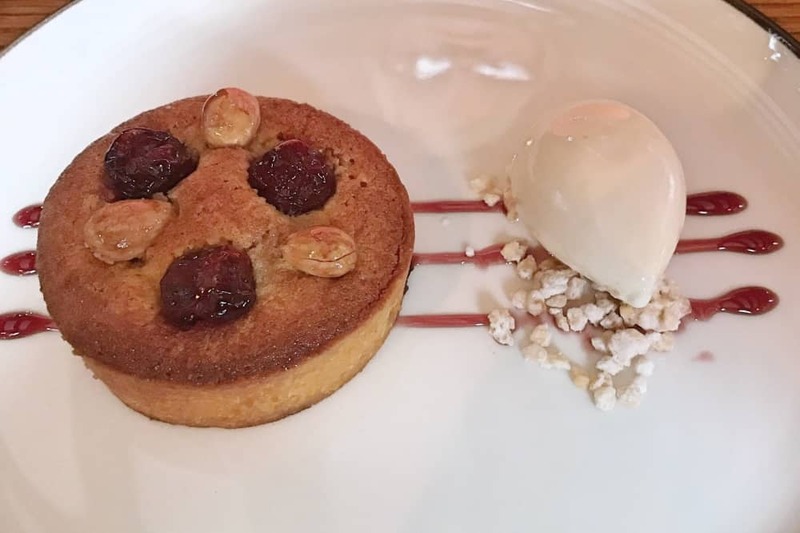 It was like stepping back into my childhood – a comforting combo of warm sponge, sweet cherries and nutty almonds. Once you have this, shop bought cakes will never hit the spot again. Take a stroll (or a roll?) around the village. It won’t take you long – about 50 metres before you make it to Story on the high street, a tiny boutique that must do the most incredible trade with all the passing foodies. Fair play though, because it’s a little haven of great taste, with lovely jewellery, fashion and homewares. It’s a short walk to the river’s edge, but if you want to push up your daily step count, head down to Bray Lock and can do some lovely looping walks around Bray, Maidenhead and Windsor. For the more adventurous, there’s paddle boarding, windsurfing or kayaking on Bray Lake. Good for: Foodies who want to experience a Heston Blumenthal’s world without choking on the bill. High quality lunchers (think good friend catch-ups or relaxed work lunches). 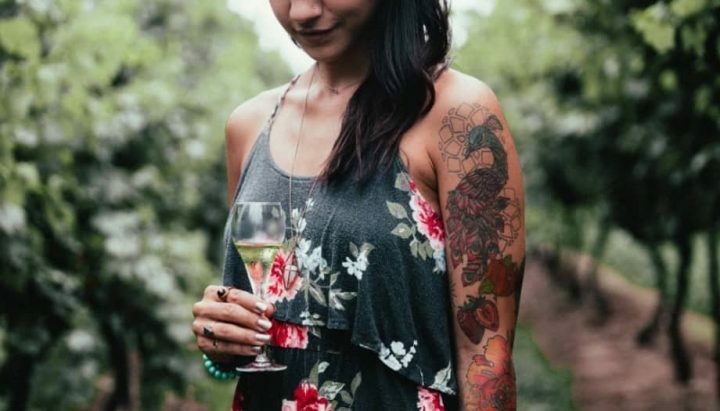 Grab the girls for cocktails, date night with the other half or special occasion family get togethers. Kids are surprisingly well catered for. Not for: Those who want a more formal white table cloth style approach to Michelin dining. £££: As befits a Michelin restaurant, you can add a couple of quid onto each course. So entrees start from £9, mains start at £20-£38 (and don’t forget to add your sides of fries and veggies to that price). Desserts start at £8. There’s a 3-course set lunch Mon-Sat for £25 a head. So I’d say it’s expensive for a ‘normal’ restaurant, but a fair price for the quality of the food – and the set menu is a cracking deal. The Hind’s Head, High St, Bray, Berkshire SL6 2AB. Tel: 01628 626151.